On 9.12.17 I parked on Lidl in Newcastle Under Lyme and left the car park for half an hour to find out what we needed for a community event and went back to do the shopping for it. Before I had opened the boot to get the shopping bags out the car park guy appeared, ended up getting really aggressive and slapped a ticket on my windscreen. No reply but threatening letter in Feb which I responded to saying that I had written to them in December. The letter complained about the persons intimidating behaviour and offered to pay them £20, as that was all I could afford and that I felt that it was a fair offer for a fine for leaving the car park for 20 minutes. I wasn't over the allowed time and did shop in the store. As my dad is the registered keeper, and he was getting the threatening letters, I did advise that I was the driver and that they did not have permission to contact him again about this. I emailed the letter and sent it special delivery, which does show as delivered. I have also since emailed the letter again asking for a response and have sent copies by first class post since. I am sure this isn't the way I should have done this but I have done it now! I have not heard anything since but today have had a Claim Form from Gladstones Solicitors asking for £168.39 parking, £25 court fee and £50 legal costs. They have clearly had my correspondence as it has come to my address not my dad's this time. Any suggestions what my next step should be as I am not sure what to fill in on the form. Surely Euro Parking Services should have responded to the offer I made, even if they didn't agree to it before passing it to Gladstones? Hang on in there help will be on the way, what correspondence have you had from Euro Parking before Galddys. You will have to acknowledge the claim, and indicate you are going to defend all best done online at MCOL, do that as soon as the team respond with further instructions. The charge is for leaving the site? Is there anything on the signage prohibiting going offsite within the permitted parking period? then we have everything to properly advise you. I've had a Notice to Keeper on 12.1.18, which I responded to and Letter before court action on 8.2.18 which I also responded to but have heard nothing since. There is a sign which I appear to have parked in front of! The last time I used the car park you could leave the site but when I used it this time it had changed. and knew I wasn't going over so didn't look much further. Even when the attendant pointed it out me I had to read the sign 3 times and then saw the leaving the car park line in smaller text. Doh! 2.The defendant was driving the Vehicle and / or is the keeper of the vehicle. I do accept that I screwed up but don't accept that £100 is a fair cost for this and the fact that I felt threatened by the attendant etc. I have offered to pay £20 previously. can you tell us exactly where that word is used on any of the paperwork please? Sorry. Thanks for that. As you can tell, I've not done this before!! 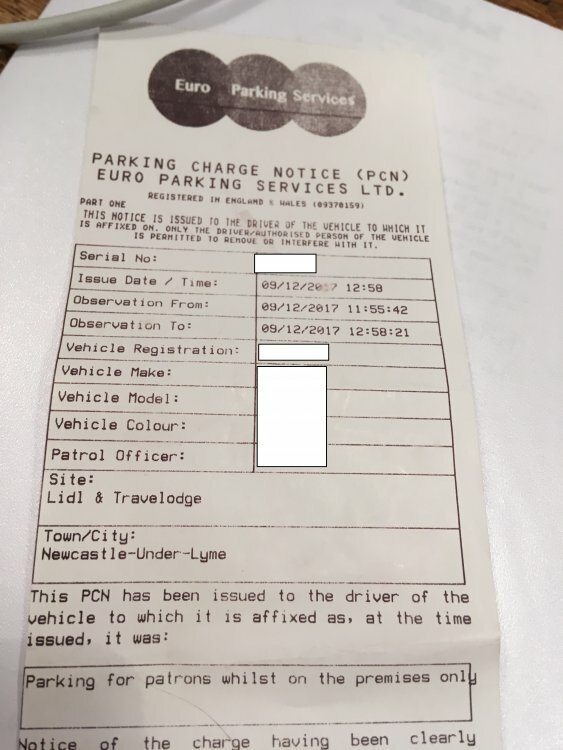 The windscreen ticket is a Parking Charge Notice and says notice on the windscreen ticket - see attached. It just says Newcastle-Under-Lyme and the store for the address. you MUST redact things before posting on an anon forum!! the address from the particulars of claim please. no the address in the particulars of claim that you typed out.. There is no address on the ticket that was posted on my windscreen apart from Lidl & Travelodge, Newcastle-Under-Lyme. There is no address on the Claim From that I have had from Gladstones Solicitors apart form theirs, Euro Parking, a County Court address and mine. It just says Lidl & Travelodge but doesn't say where on the Claim Form. the claimform is from the COURT not gladdy's. ok so post 4 what is the claim for: is exactly as its written on the claimform? It doesn't make that clear at all. It looks like it is from Gladstones as that is the address to send documents and payments to. Yes. What is the claim for in post 4 is exactly what is written on the Claim Form under Particulars of Claim. anyway, they don't state where the supposed 'offence' happened in their claim so it could be anywhere in the UK. Although mine came in a plain a5 windowed envelope with just a PO box address on the back and no indication of who it was from, adding to my surprise! I will try this and see where I get. I will post the result when I know it so others can see what happened. I have made a donation via Paypal. SOOO many people make stupid mistakes with Speculative invoice claimforms they end up in deep dodo. Follow the advice already posted by DX, and ericsbrother may well pop in with some good advice soon, cross check everything with the team here before doing anything . SezzerB could you please post up the alleged Claim Form that you received. Also the Notices sent to your father as they often get them wrong. It is a shame that you didn't appeal to Lidl straight away explaining that you did use their store to buy goods -they may well have cancelled the ticket. It was very good of you to own up and take the heat off your father but had you not done so, it would have left you in a much stronger position as if they had taken your father to Court they would have lost the case as he was not the driver. Also by owning up they feel that you will crumble and pay up before Court proceedings begin. We would advise you not to pay them and we will give you the best advice we can to send these crooks packing. That's why we are asking for copies of your Notices from them. I guess you live pretty close to the car park so if you could also post up the signage in the car park [and where they are positioned] as well as the ticket machine if there is one . Most of these companies do not have planning permission to even have signs and ANPR in the car parks. You can check this with the local Council planning office. under the Town and Country [Advertisements] regulations. If they do not have permission their signs are worthless and cannot be enforced. I went in to Lidl and spoke to someone when it happened and they said they have lots of complaints about the attendant being threatening and that is was nothing to do with them. I then complained to the Head Office about the intimidating behaviour I had experienced and that it was a poor way to let customers be treated and they said nothing to do with them, it's not their land. I've just noticed I did have a letter before action one but as I replied straight away, by recorded delivery post and email, and have had nothing else about it since I thought that they had left it alone. I argued the original charge by post when I had it, and the notice to keeper and letter before action by post and email within 7 days of receiving both. I sent copies of the original letters with the one I sent replying to the letter before action too. It does say whilst on the premises - can't argue with that. I just saw 90 mins stay and 2 hours, as that is what it has been for the last few times I had been there. It is a guy walking round who had watched me go off, and was stood by my car when I came back waiting to pounce. As I said on another post I'm not saying I didn't make the mistake but do feel really aggrieved with the way I was treated and having to pay £100+ for a genuine mistake especially as I did actually shop there. Am posting the CPR 3114 to Gladstones tomorrow. I've done the pdf its in your above post. Just relax and keep your money in your pocket. I know you have a fair bit to do at the moment but please check with the local Council re planning permission. Also do you have the Notice to Driver ? The photos of the car park would help as that often lets these idiots down. Ok, you have a claimform and so you must now defend the claim against you. Their claim is a standard vague cut and paste job so it will contain no detail as they dont spend any time and effort on this or they dont earn any money. First thing you need to do is acknowledge the claim. Best way of doing this is to set up an account online at moneyclaim. gov. uk (no spaces) and follow the procedure. the enter your case referenec and it will throw up the details. all you need to do is then tick the box saying defend in full and you buy yourself the best part of a month to submit an outline defence that will be submitted the same way. For politeness you also send a copy to the parking co's solicitors-Gladstones. Now we understand what they have done but there are things we need to know such as what did you say in your letters and more importantly, what the signs at the site say. They are claiming that the ticket given to you at the time laid out the necessary information regarding what the breach was, where the land was so it can be properly identified and other things. Now this breach must match one of the conditions or there can be no breach. Do you still have the original ticket? the fact that their bod was rude is irrelevant as is anything about why you were there or that you wandered off for a while, it is about the CONTRACT and nothing else now so show that there was no breach of the actual terms and they are stuck sayig well, we meant to say this or that but the dog ate our homework or they left the new sign on the bus. Basically Gladdsy don't have clue and you can use this to beat the claim. It is just a shame that you need to do this, if they were honest it would have all been done away with but there isnt an honest parking co in the land that would use Gladdys so you are stck with what you have. Thank you for sorting that. I only had access to my iPad last night and I couldn't work out how to amend the PDFS on that, so was going to try today on my mac. I did the AOS on the same day I received the claim form as per your advice. I don't have any other paperwork and I'm not aware that I've had a notice to driver. I've just had the documents you've posted for me. I am going to take some photos of the car park tomorrow, making very sure I don't leave the premises at any point when I do! I will speak to the Council re planing permission this week. have you sent CPR off? you say you had a threatening letter in feb, do you still have this? What correspondence do you have and what have you had that is now binned? for example if we argue that their bod only saw you at the boot of your car and they say you left the site they are stuffed unless you have admitted going off on an expedition somewhere. However, leaving the site isnt a breach because it is an unreasonable condition. It was the Letter Before Court Action I had in Feb. I haven't binned anything. Everything I have had I've kept. I have admitted leaving the site already. I have had a reply from Gladstone today. They have sent me copies of parking signs, a boundary plan of the site and letters they say I have had plus photographs of me at the car - which I feel uncomfortable about. They have also sent a 'copy' of a letter dated 7th Feb telling me they are not cancelling the charge and how to appeal via IAS, which I have never seen before as I would have appealed straight away if I had. They have sent a one page document which looks like it may be an agreement from the landlord to run parking on the site but I need to read it first as it's not clear. It also has the condition about not leaving the premises in the agreement dated 9.11.15 but I'm sure that was only brought in last year so am going to check with Lidl when that happened. They have not sent proof of planning permission. I have taken some photos of the site which I've not posted as I thought I'd wait until this came. I am happy to scan and post what I've had if it's any use. I will look at VCS v Ibbotson. Any suggestions as to what to do next would be welcome.